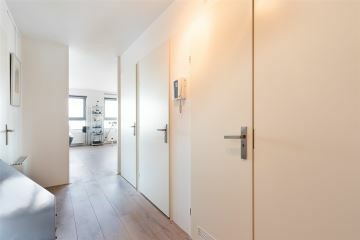 Bert Haanstrakade 178 in Amsterdam. Penthouse of 128 sqm with a breathtaking view and large rooftop terrace of ca. 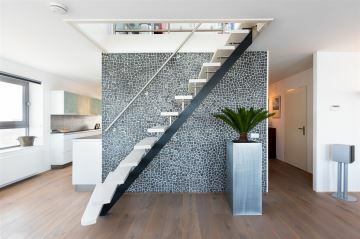 35 sqm. A "Room with a view" on Bert Haanstrakade on IJburg. 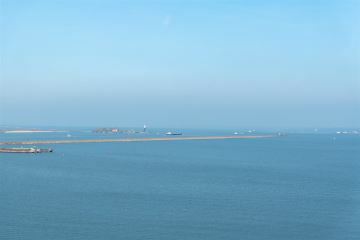 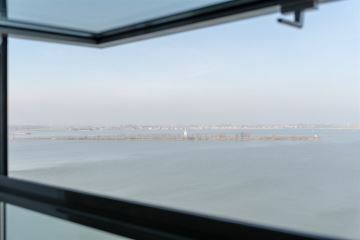 From the living room, you can enjoy a spectacular view of Durgerdam, Pampus and IJmeer lake. 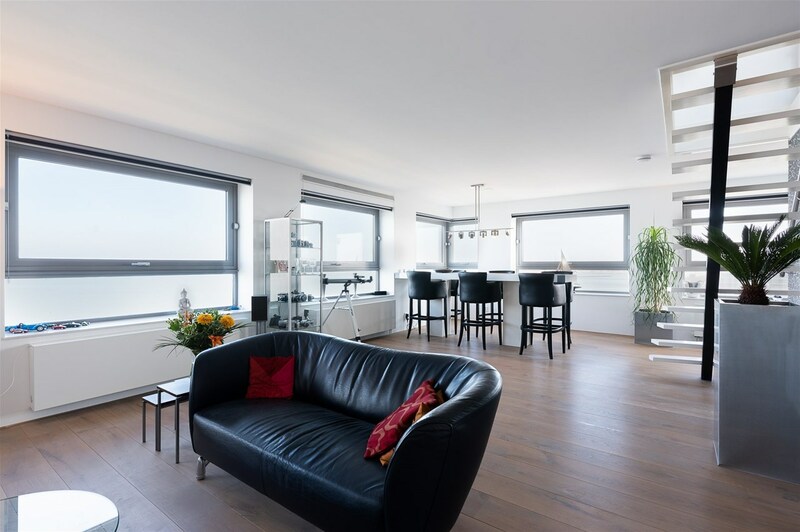 This property includes one parking space, buyers have the option to purchase a second parking space, and can even opt for the purchase of a large, secured parking garage for added storage. 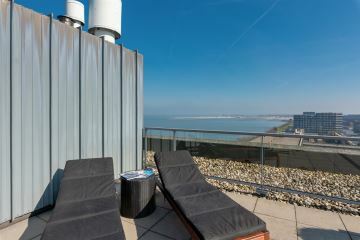 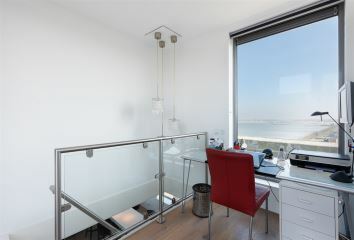 In short, a spacious home, a sunny rooftop terrace and a fabulous view of the water. Communal entrance with access to the elevator, storage unit, parking garage, courtyard garden and berths for a small boat at the rear of the complex. 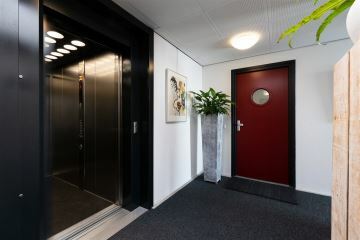 Entrance on the eighth floor, spacious hall with a coat area, laundry room, restroom, large bathroom with a walk-in shower and access from the hall to a dressing room. 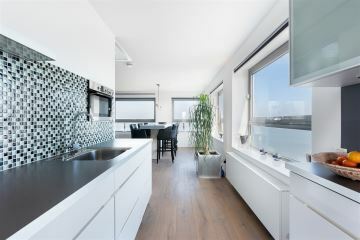 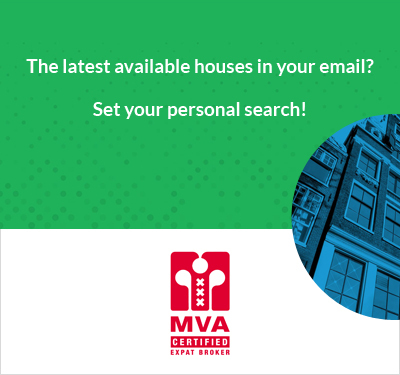 Extremely expansive living room measuring 10 meters wide facing IJmeer lake and large windows with a panoramic view of Durgerdam and Pampus island. 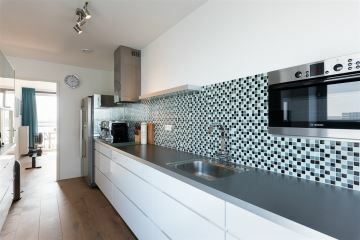 Semi-open plan kitchen with fitted appliances and 2 bedrooms at the rear, one of which currently serves as a study. 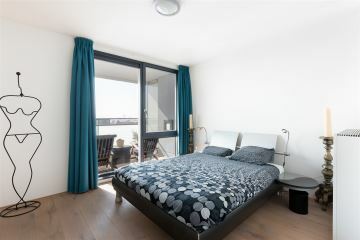 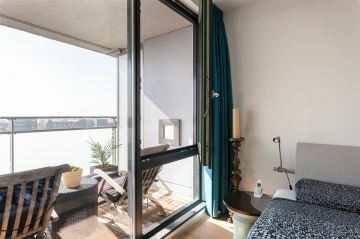 The bedrooms access the spacious balcony (South), staircase to the additional office area and access to the vast rooftop terrace with a sweeping view of Amsterdam's skyline. 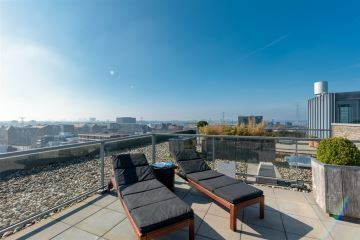 This is the perfect spot to enjoy the sun, all day long. 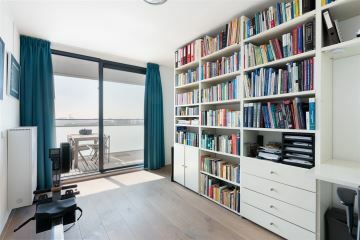 The storage unit in the substructure of the building is currently used as a "workshop". 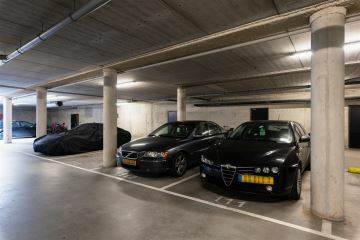 One parking space is included, a second parking space is for sale for � 15,000 costs-to-buyer. 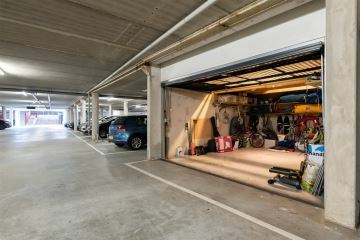 Also for sale is an extremely large, secured garage, where you can store anything from a classic car to your sailing gear. 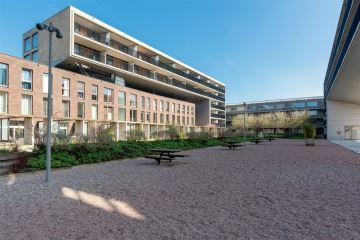 The complex features a communal jetty at the rear, which can be reached via the secured courtyard garden. 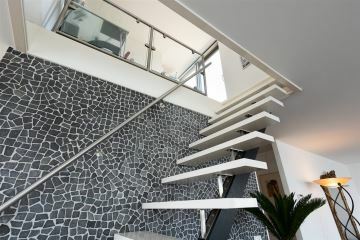 - Penthouse with a large 35sqm-rooftop terrace. 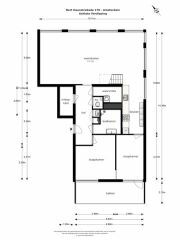 - Ground lease settled through 2055. 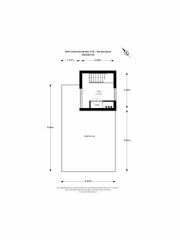 - Includes 1 parking space, 2nd available for � 15,000 costs-to-buyer. 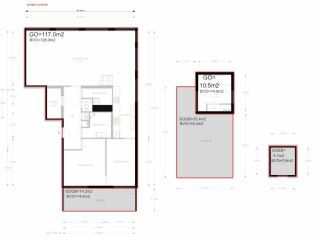 - 2 bedrooms and an office space. 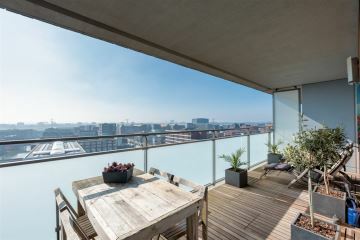 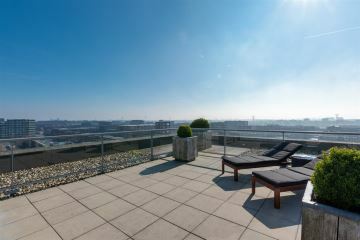 - Spacious south-facing balcony of 14 sqm. 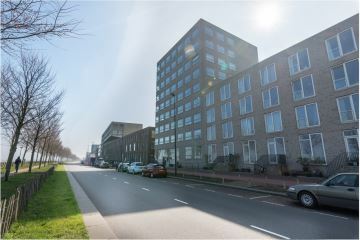 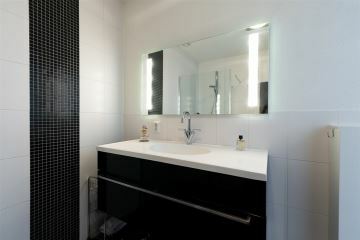 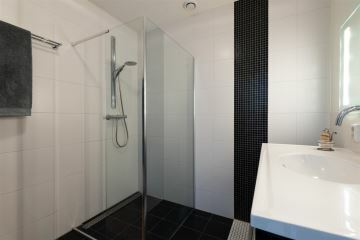 - Within walking distance of IJburg shopping center and public transportation. 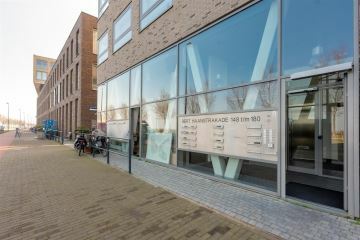 - Communal jewtty owned by the VvE homeowners association. 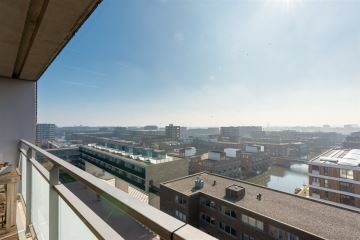 IJburg West is a brand new residential area under construction to the East of Amsterdam. 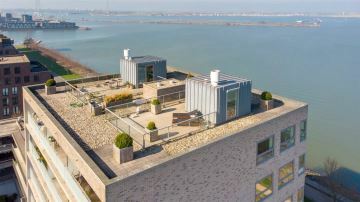 A distinctive feature of the neighbourhood, which is situated on the IJmeer, is the fact that it is built on artificial islands. 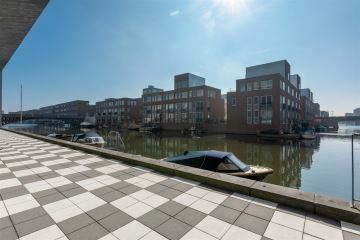 IJburg is a part of the East district, and is home to a tight-knit community with lots of young families with children. 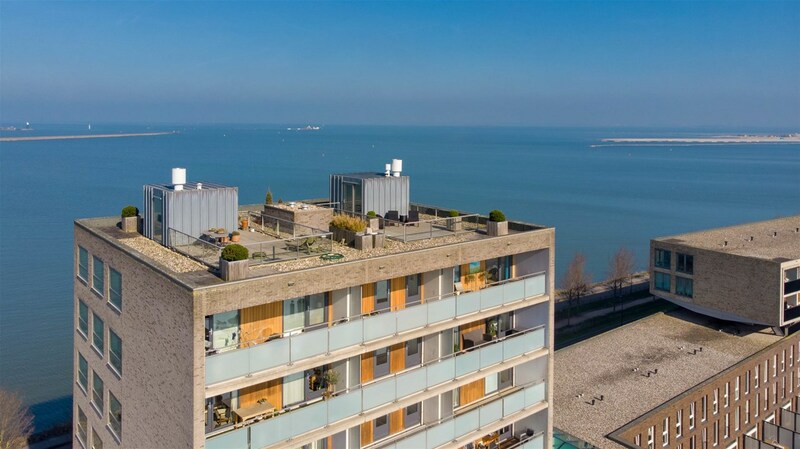 The neighbourhood boasts a great variety of properties, ranging from individual building projects to large-scale apartment blocks. 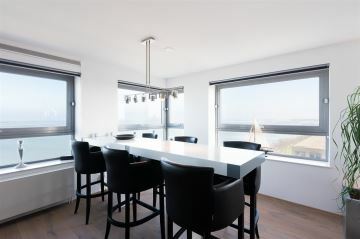 With the city beach Blijburg aan Zee and lots of cosy lunch spots, shops and bars, life is good here. 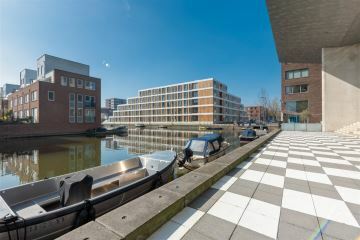 Apart from that, there are several sports and cultural events year-round, and plenty of opportunities to engage in water sports. 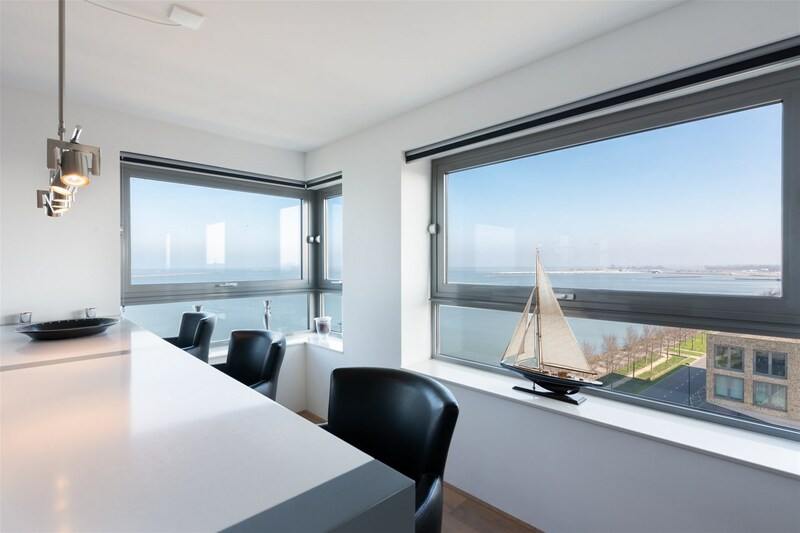 Living in IJburg means living in an environment full of greenery and water, and with all the amenities you would expect from a neighbourhood, such as schools, day-cares, supermarkets and restaurants.